The international tobacco giant has managed to fend off its biggest enemy. Find out how. Global tobacco giant Philip Morris International (NYSE:PM) has had less than a decade as an independent company with its own stock, yet already it has put together an impressive track record of growth and resiliency in a rapidly changing market. Even as rivals like British American Tobacco (NYSE:BTI) have put pressure on Philip Morris, the biggest problem the company has had to deal with lately has been currency-related, with the strong U.S. dollar weighing on the value of the sales and profits it generates overseas. Nevertheless, Philip Morris has overcome that and other obstacles so far in 2015 to produce a solid return for shareholders. Let's take a closer look at how Philip Morris has gotten the job done this year and what's ahead for the tobacco company. What has happened to Philip Morris in 2015? 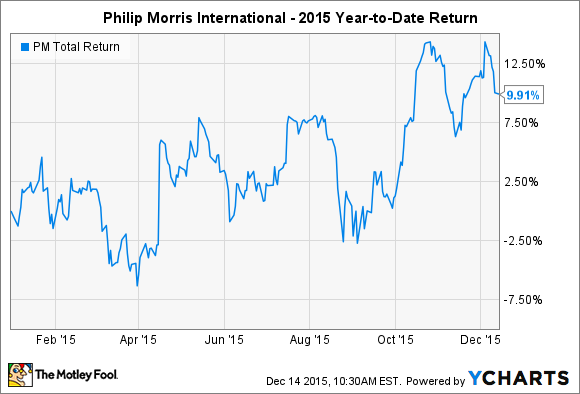 Fundamentally, Philip Morris has seen ups and downs throughout 2015. February's quarterly report gave investors a sense of the magnitude of currency headwinds the company faced, with Philip Morris seeing the strong dollar take away 9 full percentage points of revenue growth and more than a fourth of its overall earnings for the quarter. Yet by April, Philip Morris had seen conditions improve, and although the dollar still held it back, currency-neutral growth of 9% in sales and 24% in earnings per share for the first quarter was far better than most investors had expected. One key element of the turnaround was that cigarette shipment volumes rose during the quarter, with Marlboro in particular seeing gains of more than 2%. In the second half of the year, Philip Morris kept seeing the same general trends. A 12% drop in revenue in its July report masked currency impacts of more than 16 percentage points, and although earnings sagged, the company said that its full-year results would likely come in toward the high end of its previous guidance. Strong organic growth once again surfaced in the October financial report, with a rise in shipments of the key Marlboro brand offsetting weakness in other product lines. For investors who've gotten used to the commitment to shareholders that Philip Morris has demonstrated throughout its history, 2015 was a bit disappointing. The company suspended share repurchases during the year, with CFO Jacek Olczak blaming the strong U.S. dollar for hampering Philip Morris' ability to sustain what had been a healthy pace of stock buyback activity in the past. The tobacco company did manage to keep its track record of annual dividend increases intact, but a boost of just $0.02 per share to $1.02 on a quarterly basis wasn't up to par with the moves that Philip Morris has made in the past. PM Total Return Price data by YCharts. The key strategy that Philip Morris has emphasized all year is its stable of reduced-risk products, especially the iQOS heat-not-burn technology that it has helped pioneer. The rollout of iQOS continued during the year, and in November, the company said that it would make new launches in Moscow, Lisbon, and Bucharest. With past tests in markets in Japan and Italy, Philip Morris has been encouraged by early results, and hopes that its products will be able to help differentiate it from British American Tobacco and other rivals around the world. What's ahead for Philip Morris? One substantial threat for Philip Morris is on the regulatory front, where a host of countries are considering plain-packaging laws that would prevent Philip Morris from having free rein to market its cigarettes in its chosen manner. With key legal battles ongoing, Philip Morris and British American Tobacco alike hope that they'll once again hold regulators at bay, especially if the effectiveness of plain-packaging turns out to be less than advocates had hoped. Philip Morris would do a lot better if the U.S. dollar would stop strengthening, but at least for now, few market participants think that foreign currencies will bounce back from their long-term weakness. Even with those challenges, though, Philip Morris has done well to keep itself moving forward, and its strong brand and pricing power should help the tobacco giant fare well against British American Tobacco and its other competitors around the world in the year to come.